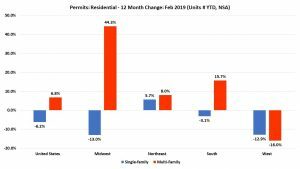 Year-to-date ending in February, single-family permits reported growth only in the Northeast region of the country. The South, Midwest, and the West regions declined by 3.1%, 13.0%, and 12.9% respectively, compared to the same time period in 2018. The Midwest region had the highest growth in multifamily (44.3%) while the West recorded a decline in multifamily permits growth (-16.0%) during the last 12 months. 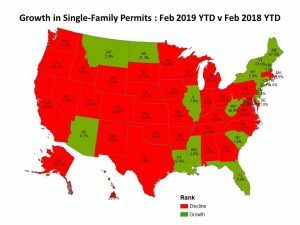 Between February 2018 YTD and February 2019 YTD, 16 states and the District of Columbia saw growth in single-family permits issued while 34 states registered a decline. The District of Columbia Colorado recorded the highest growth rate during this time at 112.5% from 24 to 51 while single-family permits in Michigan declined by 28.2%, from 2065 in 2018 to 1483 in 2019. The 10 states issuing the highest number of single-family permits combined accounted for 64.3% of the total single-family permits issued. Year-to-date, ending in February 2019, the total number of multifamily permits issued nationwide reached 68,781. This is 6.8% ahead of its level over the year 2018, 64,382. Between February 2018 YTD and February 2019 YTD, 29 states and the District of Columbia recorded growth while 21 states recorded a decline in multifamily permits. New Mexico lead the way with a sharp rise (+375.8%) in multifamily permits from 33 to 157, while North Dakota had the largest decline of 89.5% from 19 to 2. The 10 states issuing the highest number of multifamily permits combined accounted for 65.3% of the multifamily permits issued.